© Caspari. All rights reserved. 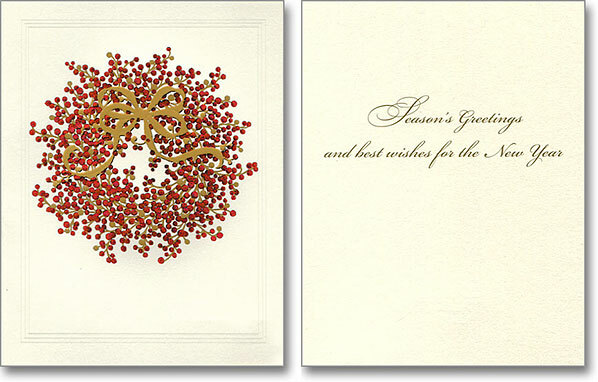 This elegant card is embossed. The artwork is enhanced with gold foil. Artist: Janine Moore. brief, eloquent messages. The company has earned its reputation over the past sixty years by reproducing the work of established artists and museums from around the world. Caspari continues to work with the same European printers and suppliers who collaborated with H. George Caspari 60 years ago. Based in the US, Caspari has offices in the United Kingdom, Denmark and Japan. Environment: Caspari prints only on Forest Stewardship Council (FSC) certified paper. The company's Swiss printer is an FSC certified printer and operates a production plant that is certified carbon neutral by First Climate.